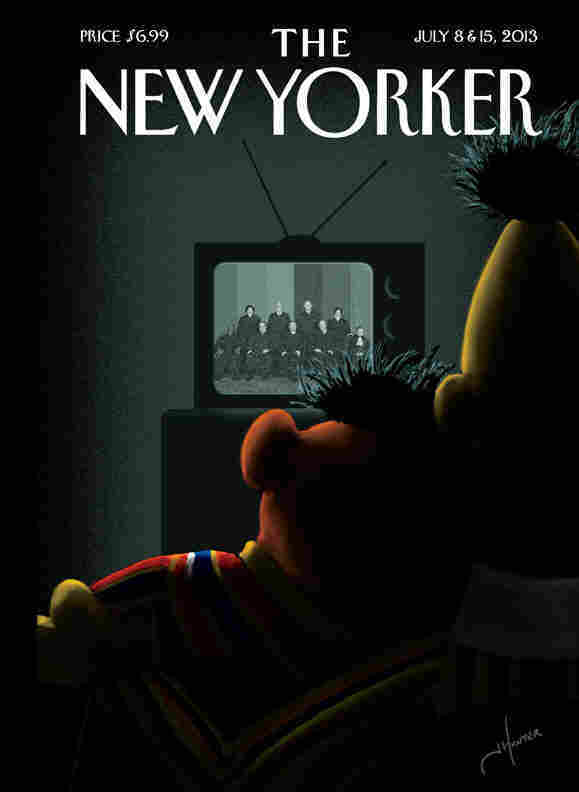 SEE: The 'New Yorker' Cover That Has People Talking : The Two-Way Bert and Ernie — yes, Sesame Street's Muppets — have been thrust yet again into the gay marriage debate. Bert and Ernie — yes, Sesame Street's Muppets — have been thrust yet again into the gay marriage debate. The New Yorker's July 8 and 15th cover. The illustrator called next week's cover "Moment of Joy." "It's amazing to witness how attitudes on gay rights have evolved in my lifetime," the New Yorker quotes Jack Hunter as saying. "This is great for our kids, a moment we can all celebrate." As you can imagine, the cover already has people talking. The Daily Beast's headline: " 'New Yorker' Outs Bert and Ernie." Jordan Weissmann, of The Atlantic, tweeted: "Fact error by the @NewYorker: Bert and Ernie could not have watched the court ruling on TV." Of course, as we told you back in 2011, Sesame Workshop says the two male Muppets who share a house and a bedroom are just friends. "Even though they are identified as male characters and possess many human traits and characteristics (as most Sesame Street Muppets™ do), they remain puppets, and do not have a sexual orientation," the workshop said.